Features 25 veteran and rookie players. 2012 Topps Finest Football returns with a familiar configuration that focuses largely on rookies and first-year ink. Refractors aren't left out of the mix either. Every 12-pack box is divided up into two mini boxes, each promising their own premium hit. One of the mini boxes comes with a numbered Rookie Refractor Autographed Patch card, while the other has an Autographed Jumbo Relic. The 150-card 2012 Topps Finest Football base set breaks down to 100 veterans and 50 rookie cards. All have seven different Refractors plus Printing Plates. Rookies also have Rookie Refractor Autograph Variations that come with an on-card signature. The latest rookie class figures prominently throughout 2012 Topps Finest Football, with autographs from key standouts Andrew Luck, Robert Griffin III, Trent Richardson and Justin Blackmon in several insert sets. The one-per-master-box Rookie Refractor Autographed Patch cards are all serial-numbered. Each comes with a multi-colored swatch and seven different Refractor parallels including new Pulsar Refractors. One-of-one Black Refractors have an NFL shield logo from a Rookie Premiere football. A total of 40 different Rookie Refractor Autographed Patch cards are in the set. Sticking with the signature swatch theme are 20 Rookie Autographed Jumbo Patch cards. Numbered to 5, the cards are a rare find. The other master box hit is an Autographed Jumbo Relic Refractor. The 55-card checklist has both rookies and veterans. All are numbered and come with several different Refractor parallels. Other autographed-relic combinations include dual-, triple- and quad-signed cards showcasing the 2012 rookie class. Falling 1:6 packs, 25 Rookie Atomic Refractors have a die-cut design. Parallels feature on-card autographs. Sticking with the rookie die cut theme is an insert dedicated to Andrew Luck. Lucky Cuts has both autographed and patch parallels. Good: Loaded with something for all collectors, set builders have a manageable 150-card checklist, Refractors, Autographs and Autographed Patch cards look especially good. Bad: In 2011 there wasn’t a single numbered autograph card that exceeded 599 copies. In 2012, there are plenty of autograph cards numbered to 1,353 and above. There is also a major imbalance between the number of top players and less-desirable signers. The Bottom Line: Finest is one of my favorite football card brands. 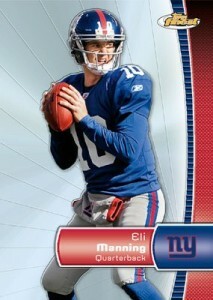 2012 Topps Finest Football lives up to past sets. It combines attractive cards, plenty of rookies and lots of high-end opportunities at a lower price than several other similarly themed releases. Keeping with the Finest tradition, all cards feature in-action portraits and are printed on a thick card stock adorned with a beautiful chrome finish. From the base cards to the Refractors, relics and autographs, you'll be hard-pressed to find an ugly card. The base card design is among the best in the business and certainly one of the best uses of Topps' chrome stock. 2012 Topps Finest Football has lots of other beautiful card designs, particularly with the inserts.The Refractors look great, especially the Die-Cut Atomic Rookie Refractors. The look alone adds value to the product. It's because of all the potentially awesome chase cards that I end up purchasing a box of this product every year. This is despite the fact that I've never had much luck as far as big pulls go. 2012 Topps Finest Football has a couple of issue, though. One was a considerable amount of a powdery residue on my cards. Besides being unpleasant, some of that residue was not very fine and scratched the sensitive foil surface. The collation of the base rookies in my box wasn't great either. I received doubles in a box with only 60 cards. This does not sit well with the set builder side of me. The checklist is extensive, ranging from the big-name prospects to young stars to veterans. The base set is comprised of 150 cards (100 veterans and 50 rookies). Finest's checklist doesn't dabble in retired players, which is refreshing and gives it the type of continuity a lot of set builders prefer. Another nice thing about opening a box that only contains 60 cards is that you don't get overwhelmed by junk inserts. I'll take a Refractor over a generic insert any day of the week. 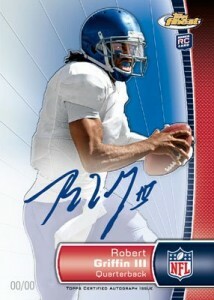 Landing an autograph of a top player in 2012 Topps Finest Football can be tough. In 2011 one of the players to sign the most was Taiwan Jones. He had about 1,650 total autographs. That meant, on average, for every Cam Newton autograph that was pulled there were five Taiwan Jones autographs. In 2012, one of the players to sign the most is Ryan Broyles. He has about 3,600 total autograph cards. So, for every Andrew Luck autograph, there are about 14 Ryan Broyles. That's an increase of nearly three times. At around 100 dollars a box, I would expect more out of a box. Even with the potential to hit an Andrew Luck or Robert Griffin III autograph, the odds are really stacked against you. The second tier of prospects, like Russell Wilson, Ryan Tannehill, and Brandon Weeden, is solid but their values may not justify the box price. Some might disagree with me since the potential is there, but if you buy a bunch of boxes and don't get a big hit, you may feel disappointed. I love Finest's mini-box format. It's fun to feel like you're opening two boxes at once. Very few products at this price range offer the level of craftsmanship, continuity, and overall excitement as Finest does. I could have gotten better hits but I still thoroughly enjoyed it. O recommend that anyone with an interest in football cards give it a shot. Unlike the box value, the fun factor is certainly there on this product regardless of what hit cards you pull. This is not a hit-only type of product, so one would really have to enjoy base and inserts in order to fully enjoy the overall product. my favorite product of the year. Love the rookie auto patches and atomic refractors. I love the design and appearance. This product seems to maintain good value and you feel breaks come close to investment. Wish it had more logos incorporated. My main caution to topps is to watch saturation of “shiny” products. Finest, Chrome, and recently Platinum although different have enough similarities and can over saturation those who like the “refractor” and “chrome-like” (paul can i say that or is it TM) looks. Always liked this product. Refractors and base cards are nice. but the one downfall other than the high numbered auto patches..is the 00 on players jerseys. ugggggg that really bothers me!! At least make up a number!! Other than that not a bad product. ok so for finest, yuck. the product last year was so great, this years really bummed me out. autos out of 1500?? seriously?? id like to know who sat there and said thats a good idea, they need to think that over again. cards didnt look to bad but for the content and price, no where near being acceptable. i want a chance at pulling the luck or rg3 but when they max at /25..theres less than 5% chance of even pulling one..why would i buy? i know its nit picking but last year in one case i got 3 of big 5 qb’s. this year saw more than 5 cases open and im not sure there was even one big name qb, in any of em. hope this isnt the case for next years product or ill be passing. I really like the design of this years product. The refractor look very nice this year along with base ones. However, for a hundred bucks, I would like to get an autograph that is under 1,500 copies. Nice design, not a lot of value. This set has a great card design. I see people aren’t happy about the number of autographs out there. It is a little disconcerting when there are that many, but at the same time, it seems like you have a better shot at a Luck or RGIII auto, so maybe it balances out? I think I’d prefer to buy a box of Inception, but I would still be happy to buy singles from this product. 4 I was disapppointed that I didn’t even pull a base LUck. That said, it does mean that the pull would be more valuable. At least I pulled a base RGIII, so not a total loss. I was disapppointed that I didn’t even pull a base LUck. That said, it does mean that the pull would be more valuable. At least I pulled a base RGIII, so not a total loss. I did a split of this set with my daughters boyfriend. The cards are really nice and well thought out. My only caveat is the one hit auto per mini box at such high distribution numbers. This makes the secondary market a little low compared to other products out there, hence my three star rating.